Skin is the most important outer part of your body, it is your skin which reflects your inner health and takes care of your appearance. If you are not feeding on healthy food it directly affects your skin health, that’s why it is very vital to nourish your skin with healthy foods. Fruits are known to be beneficial for your overall health. Let’s see what fruits have to offer for your skin health. Avocados – are highly nutritious known for providing amazing health benefits and excellent for maintaining skin health. 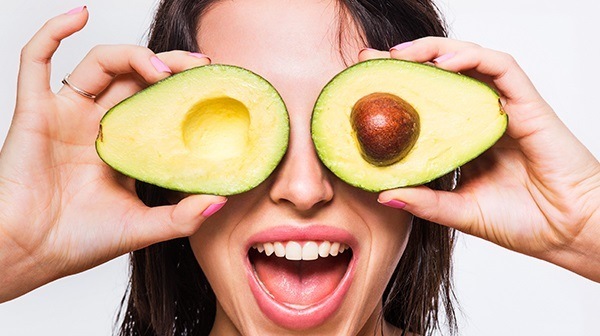 Avocados are packed with vitamin E, fatty acids and other essential nutrients that help nourish your skin giving it a glowing effect when consumed regularly. Kiwi- a super fruit is an incredibly nutritious and a tasty fruit which is packed with more than 20 vital nutrients. Kiwi is loaded with vitamin C in high amounts, packed with antioxidant called lutein which is excellent for skin health and protects it from harmful UV light rays. Regular consumption of kiwi can give your skin much needed nutrition to keep it looking healthy and radiant. Pineapple – Nutritional value of pine apple is excellent, it contains an enzyme called bromelian that have anti-inflammatory, anti-clotting and anti-cancerous properties. Bromelian provides excellent benefits for skin health too; pineapple is a natural antioxidant that can make your skin look firm and radiant when consumed regularly. You can also apply pineapple juice or pulp on your face which aids in removal of dead skin and reveal a glowing skin. Papaya – is naturally loaded with high amounts of vitamin C, beta carotene and a vital enzyme called papain. Papaya is highly antioxidant in nature which helps in skin protection. Consuming papaya regularly nourishes your skin and also if you apply papaya pulp to your skin it gives a youthful look and makes it healthy. Pomegranates- known as health fruits, pomegranate can beat all the other fruits in nutritional value and the numerous healthy properties it carries. Rich in nutrients and packed with antioxidants pomegranates are good for skin health. If you desire for a smooth and glowing skin then include these super fruits for an amazingly healthy skin. Straw berries – straw berries are rich in vitamin C and packed with alpha hydroxyl acid which is known to fight off acne and clear the skin of all the blemishes. Strawberries are also source of ellagic acid that helps prevent formation of wrinkles by protection the collagen. Include strawberries in your daily diet of fruits to keep your skin youthful and radiant. Orange -oranges are so nutritious and delicious that’s its very hard to resist this wonder fruit. You can consume this fruit everyday to get a healthy skin. Rich in vitamin C and loaded with antioxidants oranges are on top of the list amongst other fruits. Oranges have the ability to prevent oxidative damage and help in collagen synthesis this makes it even more important fruit. If you want to nourish your skin have oranges regularly and see the positive effects it has on your skin. Conclusion – You have seen how fruits can nourish your skin to make it look healthy and radiant. Include as many fresh fruits as possible in your daily diet, doing so not only takes care of your skin but also provides you with other health benefits. Next: Is Winter Season Interlinked To Depressive Mood?